Size of population means number or quantity to have less or more population of a certain place, at a certain time. Size of population is always changing. It helps to make planning. It helps to maintain balance between population and expenses. It helps for proportional development. It also helps for grand local participation. During the time of Jesus Christ the population was 25 million. During the period of agrarian society population was only 15 million. In the beginning of Roman imperialism, the population was 250 million. Population in 1930 was 2 billion. Population in 1975 was 4 billion. On 11 July 1999, the population was 6 billion. So,every year on 11 July,'Six Billion Day' is celebrated. Population growth rate means increase in total number of population by birth and net migration. It is calculated in percentage. Nepal's population growth rate is 1.35%. It means the population is increasingat the rate of 1.35 . Foreign employment service: More than 20 lakhs people are in abroad. 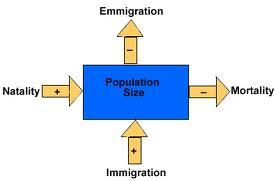 Size of population means number or quantity to have less or more population at a certain place, at a certain time. On 11 July 1999, the population was 6 billion. So, every year on 11 July,'Six Billion Day' is celebrated. Nepal's population growth rate is 1.35%. The causes of population growth in Nepal are early marriage, polygamy,desire of son, ignorance, economic importance of children, lack of population education, etc. Reasons of decrement of population during 1911 to 1930 are unscientific census, death due to diseases, death of soldiers in first world war and death by natural calamities. "Now the population of Nepal has reached up to 23.1 million. It is quite alarming if we compare this more population with limited physical structure of Nepal." Give your opinion why we are having problem of rapid population growth and also discuss the ways to reduce it. Population growth rate more than two percent is defined as rapid population growth. In Nepal, population growth rate is always more than two and at present, it is accounted as 2.24 percent per annum. These two statistics show that the growth rate of population is in increasing rate. This is probably due to rapid decrease on mortality , slow declination of facilities and increase in natural disasters. Due to all these reasons, we are having the problem of rapid population growth. The rapid growth of population is due to the high fertility. To reduce fertility, there are two ways: one is direct and another is indirect. In direct way, we can delay for marriage, use contraceptives and force for birth control. Besides these, we can go through indirect ways which reduce fertility by changing behavior and mortality. For example, education reduces family size. Similarly, knowledge, communication and urbanization also reduce the number of children. What do you mean by population growth rate? List any four causes of population growth in Nepal? How does "Desire for Son" help to increase population? In Nepal, there is a tendency in a family to have a son. Our social values encourage families to have at least a son to continue their family tree. Son is also important for a family as he will be the caretaker of the parents during their old age. With these ideas, people tend to produce children until they have a son, no matter how many girl child they produce. If one partner cannot give them a son then they will remarry leading to polygamy. Nepal's population growth rate is ______%. Which one is the benefits of size of population? Reasons of decrement of population in 1911 to 1930 is ______. Population between 15 to 59 years old who are involved in income generating activities are called ______. What is the main cause of population increase after some years of First World War????? Describe the trend of poplation change from 1968 B.S and with the reasons.